On Friday evening, the RBC Cup held its Awards Gala in Summerside, PEI, and Adam Tambellini, Devon Toews and Trevor Cameron walked away with hardware. Tambellini was named the tournament's top forward, Toews picked up the top defenceman award and Cameron was one of five winners of the RBC Legacy Scholarship. SUMMERSIDE, P.E.I. – The 2013 RBC Cup, Canada's 43rd National Junior A Championship, held its awards banquet on Friday night at the Harbourfront Theatre. The recipients of all six individual awards were announced at the banquet. In addition, Brooks Bandits (Alberta Junior Hockey League) forward Cam Maclise was presented with the 2013 RBC Canadian Junior Hockey League Player of the Year award. A third-year Bandit and Brooks’ captain this season, Cam Maclise finished in the top three in Alberta Junior Hockey League scoring for the second consecutive year, scoring 27 goals and adding a league-leading 56 assists, sparking an offence that scored almost 100 goals more than any other AJHL team. Maclise was rewarded for his offensive exploits with the AJHL MVP award, and was named Brooks’ most valuable player and top forward for the second year in a row. Thomas Martin of the Vaudreuil-Dorion Mustangs (Ligue de hockey junior AAA du Québec) was on hand in Summerside to receive the RBC National Junior A Scholarship. Martin was chosen from 10 finalists – one from each of the Canadian Junior Hockey League's member leagues – to receive the $5,000 scholarship. 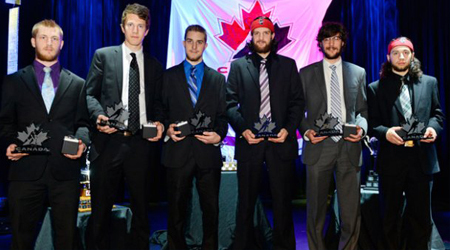 The RBC Cup Legacy Scholarships were also handed out at the awards banquet. 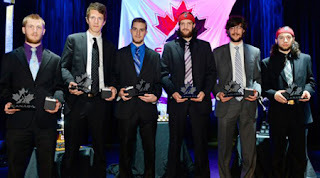 Established following the 2004 RBC Royal Bank Cup in Grande Prairie, Alta., and contributed to following successful National Junior A Championships in Weyburn, Sask., Prince George, B.C., and Cornwall, Ont., these $500 scholarships are awarded to one graduating 20-year-old player from each of the five participating teams. After six days of preliminary round action, the semifinals are set for Saturday. In the early game at 2 p.m. AT, the Brooks Bandits (3-1) will take on the Minnesota Wilderness (1-3), while the Surrey Eagles (3-1) will face the host Summerside Western Capitals (2-2) in the late semifinal at 6 p.m. AT.